11. Mollie Banks b 21 Sept 1884 Letcher Co KY died at 8 months of age. James H Banks, son of William Banks and Nancy Haney Banks, was born on Kingdom Come Creek, Letcher County, Nov 8 1837. James' father, William Banks, had come from North Carolina with Henry Banks, James' grandfather, when a very young man. Henry setteled on Kingdom Come near Andrew Frazier's farm about 1800. Nancy Haney, James' mother, came from Scott County, VA., where her parents had settled after leaving Ireland. James H Banks was married January 3, 1856, to Lucinda Blair, daughter of John Robinson Blair and Elizabeth Harrison Blair at her home near the head of Big Cowan. 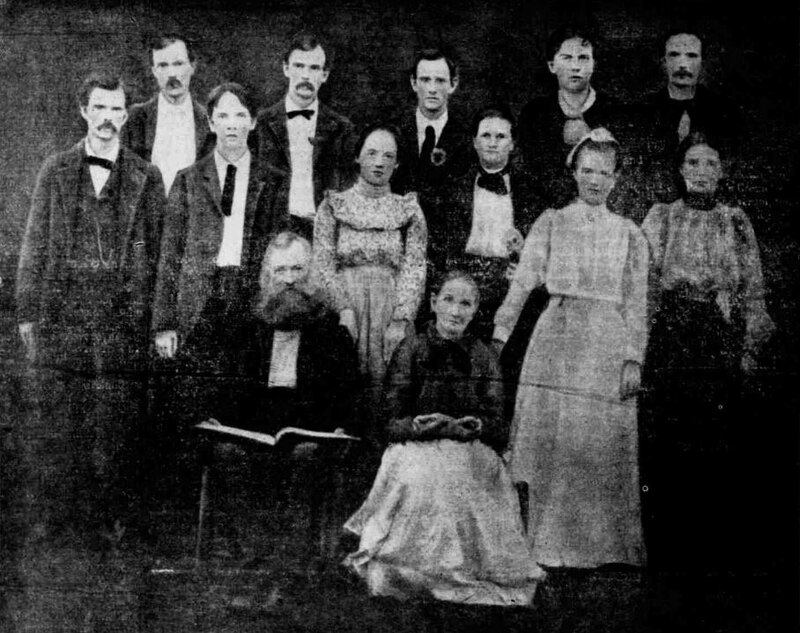 They were married by the Elder John A. Caudill in the presence of Isaac and Elizabeth Dixon. Elizabeth Dixon was a sister of James H. Banks. Lucinda Blair Banks, was born August 17, 1840 and died Jan. 1. 1920. To she and James H. Banks were born 12 children, five of whom are living (on July 3, 1952); Nancy V. Bolling, 91, Eolia; William Banks, 84, Whitesburg; Rebecca Jones, 77, Little Cowan; Lula Jones, 73, Little Cowan; and N. Patrick Banks, 65, of Little Cowan. Deceased are Hiram T. Banks who lived to be 91, Elizabeth J. Banks, 71, Lavinia Hale, 29, Samuel P. Banks, 76, John R. Banks, 81, Simeon J Banks, 69, and Mollie Banks, eight months. Of the 12 children, six were teachers in our public school systems. Lavinia taught school until she married Nathaniel Hale in 1891. Five of the sons taught for many years. Simeon J, Banks did not teach. He will be remembered as a deputy in the County Clerk's office for a period of eight years.